UFC 231 is finally upon us as Max 'Blessed' Holloway and Brian 'T-City' Ortega headline the stacked card. We have all been desperate to see this title fight, especially after Holloway had to withdraw from their originally scheduled fight back in July. Hopefully he is healthy and makes weight without any issues to take on his fellow featherweight killer. These guys improve drastically each time they enter the cage. Holloway has only lost to Dustin Poirier, Dennis Bermudez and Conor McGregor but he was only 20 and 21 years old at the time and has since won 12 fights in a row and proved he is the best in the division after finishing the greatest featherweight champion of all time in Jose Aldo – twice. Ortega is embarking on a similar rise and since joining the UFC in 2014 at the age of 23, has strung together impressive wins and like Holloway, none more so than his last two fights; an astonishing submission over Cub Swanson and a shocking knockout over Frankie Edgar. Their styles make it impossible for this to be a boring fight. Holloway is immaculate on the feet and uses his movement, reach and technique to destructive effect whereas Ortega is a Jiu-Jitsu wizard and truly one of the best practitioners in MMA. His submission game is incredibly dangerous but he also proved the calibre of his stand-up by upper cutting Edgar - who had never been finished before - into another dimension. The biggest threat to Holloway’s title is clearly in the grappling of Ortega and even though his last fight with Edgar will make the champ wary of the power in his hands, he will be more than confident of winning the stand-up battle. Ortega is used to having the reach advantage which helps him tie up chokes at will but he will not have the advantage over Holloway. 'Blessed' is all about delivering constant damage from range and has the technique to outclass Ortega. So, 'T-City' will feel Holloway out on the feet but will try and clinch up as soon as he eats too many shots. 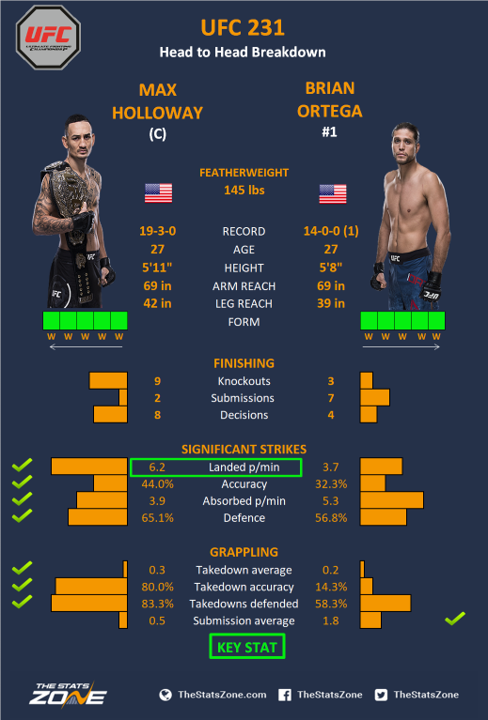 Holloway will look to dictate the fight with his masterful distance control but Ortega is so dangerous and only needs a slight mistake to find a finish. A mistake while grappling and Ortega can find a submission from anywhere. Whether that is on the feet, in the clinch or even in his guard, he always finds a way to win regardless of how the fight is going. Ortega has proven you can never count him out and Holloway will have to be at his very best to find the win. It his hard to go against Ortega but the difference will come down to Holloway's distance control and takedown defence.